Mass Effect is about a lot of things. Shooting. Flying. Driving. Talking. Space magic. It's also a series about relationships. Life, love, loss and all the wonderful — and terrible — emotions that go along with them. You usually get together with — or, game-depending, just get together with — a prospective partner as a result of simply passing a level, or answering a few questions, or, if a developer is feeling really adventurous, doing both. It's all terrifyingly simple. If there's romance to be had, then, I'll do my best to have it. Not just for me, though. Insights into the mindset of a video game developer are all well and good, but as lame as it sounds, when it comes to role-playing games, I like to role-play. It's, uh, kind of the point! So if there are partners to be had in a game, then I'll roll up my sleeves and woo my arse off. Not for me. For my Shepard. Despite this, in the first Mass Effect, a game in which it seemed you could make a move on anything that moved, I failed to romance a single soul. Or, shall I say, I politely declined the opportunities. Tali seemed too... impractical. Liara too soppy. Ashley, no, space racists are not my Shepard's type, thanks. It wasn't a failure of BioWare's systems; more a failure of their characters. And what a match she was. Stringing Shepard along for three-quarters of the game, dancing the line between friend and enemy, she was as feisty in the dialogue tree as she was handy in combat. She and my Shepard were made for each other. Then Mass Effect 3 came along. And my Shepard's Miranda was gone. 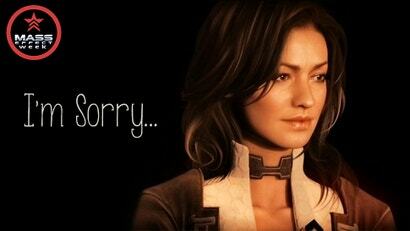 She was no longer the Miranda Lawson my Shepard had fallen in love with. She'd become... Princess Peach. The damsel in distress. That's not what I — well, my Shepard — had signed up for. We'd grown apart. She was sad about her family. Shepard was still punching reporters. She was sad about her family. Shepard was about to be teleported into an ancient space station overflowing with human corpses. She was... sad about her family. Shepard was about to end all life as we know it by picking a colour. That cold, empty few minutes was about all the remains of our relationship deserved. We'd just become... two different people. Too different. As strange as this sounds with regards to Mass Effect 3, it was best things end the way they did. Seriously, what is it with Kotaku and flooding us with a particular games articles for a week? What happened this week that would make them think that ME is a hot topic all of a sudden? Genuine question. The way i see it, starting from scratch and playing all 3 games back to back will give me the best chance of working up the desire to finish 3. I love the series, but i gave up half way through the third over a year ago and havent been back. I personally didn't give up, and I was about 60% through, work got in the way. I just sort of never really had the urge to play it after that, but I guess being on origin and not on steam sort of makes it something I don't think about. I believe this one is for ME3's one year anniversary. Suprise! It's an event they're running on Kotaku US. Mass Effect week. The cynical side of me wants to say it's something EA are getting them to do as a PR move to try and make people forget about the ending to ME3 and tire themselves out complaining before a new Mass Effect announcement is made. That's pretty paranoid though, so maybe they're telling the truth when they say it's just a look back after the release of ME3's final DLC pack. Yeah I didn't realise that, must have missed it. I wouldn't get too paranoid, they did flood us with Witcher 2 articles a few weeks ago and I am sure there have been a couple others. I'm not sure if it was ever actually mentioned on the AU site. I saw the announcement in a link someone else posted in a comment. I think they did one of those new hub things they've been doing lately and for some reason it only showed on the US site. Either that or it just happened in the middle of the night (I'm always busy or asleep during 'While You Were Sleeping'). So let's blame serrells then. Unfortunately, Kotaku US announce this week is ME week. We did not get any notification and all we get are articles copy pasted from the US site to AU site. Good to see I'm not the only one that was a little off balance about Miranda's behaviour in ME3. She really did get...weaker, I guess? I think that the pressure dropped off Miranda once she was no longer with Cerberus and no longer responsible for keeping tabs on Shep. Once she found out about the Reapers she knew she had to make her family safe. Shep already had plenty of support and she knew Shep had a job to do. As she said, when Shep offered to help her, this was something she had to do herself. She made it solo all the way through Sanctuary (full of Reapers and Cerberus) and survived a fight with the Illusive Man's top assassin. I wouldn't say she's weak, but she put saving her family first. Not something I would particularly blame her for, as I'm sure the temptation to do the same in her position would be enormous. She was also considered a war criminal due to her (previous) ties to Cerberus, meaning that she couldn't help Shepard in ME3, regardless of whether she wanted to or not. She went from being in control of pretty much everything in ME2 to being in control of nothing in ME3, and it really isn't a surprise that she shows more vulnerability in ME3 because of this. I always saw her drive to save her sister not only as a desire to save her from the horribleness that was her father, but as one of the few positive things she could do at the time. Yeah, that slipped my mind. It's hard to help when you're on the run from the law! I agree. Miranda dropped off the map in the 3rd game. I was expecting that she'll be pivotal in plotting the downfall of cerberus or at least have some bigger role in saving the universe. This is what pisses me off, they just become some points you collect to galactic readiness. I think your criticism is a bit harsh. Given Miranda is both on the run from, and battling the forces of, the Illusive Man (and consequently, the Reapers), her father (who in ME2 is said to be almost as powerful as the Illusive Man in terms of money and influence) and the Alliance, it doesn't seem unreasonable that on her own, her odds of survival are nil. Keeping her alive would take a significant amount of work, because it's unlikely anyone else would have survived no matter how much assistance they were given. Shep never had to combat all four simultaneously, and did anyone get through the game without ever being killed? And he had the Normandy and its crew backing him up. Behaviorally, if you read the Shadow Broker's file on her, you'll know her mental state in ME2 was somewhat compromised*, so it might not be a true reflection of her character in more extreme circumstances. Liara even mentions that Shep' s influence has essentially brought her back from the brink. Lastly, given the Illusive Man and her father clearly had some fairly sinister plans for Miranda - and given the Reaper connection had become clear at the time - the focus on her "sister" (i.e. her 100% genetic duplicate) and keeping her out of the hands of both does make some sense in terms of the overall Reaper conflict. Whatever they both had planned, it was clearly connected to the reapers in some way, and that connection wasn't good. * Given that she was specifically created and raised to ensure a continuing family legacy, emphasising her physical perfection, the revelation that her body's one physical flaw was that she couldn't conceive would be probably the most devastatingly awful betrayal she could imagine.